These awesome, inspiring words impact how we live our everyday lives. As a result of these words, as ask ourselves what Jesus would do. We stop before making decisions and consider first if it is right or wrong in the sight of God. And we try to live in a way that pleases God. That’s not what we generally expect when we’ve done something well. After living in the image of Christ, sharing the gifts He’s given us, and even in the small things always choosing righteously, we would expect to receive thanks. -Thanks, Jesus, that I’m doing all this work and denying myself sinful desires to please you? -Thank you Jesus that I’ve made my whole life about you and serving you? -Thanks Jesus for encouraging me to sacrifice everything and give a ton up so that you can be glorified? Indeed, these seemingly backwards “thanks” are correct. It seems crazy to give thanks for something that you do and that is a cost to you at times. However, giving thanks to God is actually what’s best for us. Praising Him is what we are made for. Our joy is so closely connected to our gratitude because the two work together to bring life into perspective. 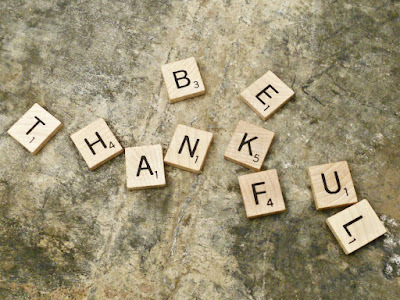 Like the lens in our eyes, we use gratitude to bring all that we see into focus. For example, if we do all to the glory of God but do so with giving thanks to Him for that blessed opportunity, we see our glory-giving as way of building up our worth or of improving our own fortunes. To do all to the glory of God and give thanks at the same time, we recognize that it is only by the grace of God that we get to do what we were designed to in the first place: glorify Him. Too often we twist our glorifying God into a way of receiving glory for ourselves. Remember that the words we long to hear in eternity from the Lord (with our sinful right to self cast aside) are not "thanks for that" but "In you I am well-pleased." We are a culture of people who perform and then look for the praise for ourselves. We rarely give thanks that we had the means to be able to do the task. It makes my heart sad that we can't simply look to God throughout our day and offer thanks just because! Your words have me thinking and since I am leading a call to gratitude at a night of prayer next week, I will be reflecting on them some more. Hope your week is blessed. Amen, Mary! I pray your call to gratitude gives Him glory : ) Have a blessed week yourself! Love this: "...we recognize that it is only by the grace of God that we get to do what we were designed to in the first place: glorify Him." Thanks for linking up to Testimony Tuesday! Thanks for hosting, Holly! Always a pleasure.